A perfect storage solution. to the increasing number of CDs and DVDs in your home, without having to have them on show. 84″ wide, 21″ deep, 35″ high. 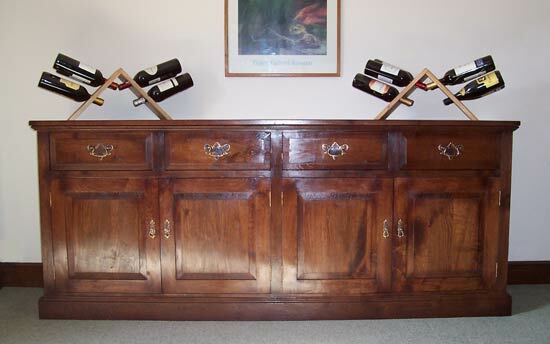 This sideboard provides an excellent storage solution for hiding away cds and dvds. CD racks: Four drawers in total. Each drawer holds three rows of CDs (front to back). DVD racks: There are two cupboards, each with three drawers, broken into four sections. You can store 26 standard sized DVDs in each section of the drawer. One section has been made wider for DVD box sets. The CD DVD Storage Cabinet can be made deeper (2″ increments). The width can be altered to suit your requirements. Door panels can be: Raised Fielded (as seen above), Single or Double beading. The drawer fronts would be matched to the style chosen. This CD DVD Storage Cabinet is in a traditional design but alterations can be made so a contemporary CD DVD storage solution is achieved.